Skywalker is one of the best known trampoline brands in the industry and their attention to detail is what makes the difference. If there is one thing that stands out in reviews it would be that their products are made to last. Designed with the utmost in quality, those jumping on the Skywalker rectangular trampoline will also find the bounce to be superior to other models. In addition, this trampoline is designed to take up a more narrow space in the yard making it an excellent fit for smaller areas or just saving space. All parts are made to be durable, long lasting and with safe family fun in mind. Skywalker rectangular trampolines are a leading choice in their field. This shape, with the long straight sides is great for competition jumpers, aspiring athletes and those who are interested in the higher leaping experience. The design, will give a greater lift versus the traditional round trampolines. This is due to the springs working at different rates giving the jumper more control over their height and landing. 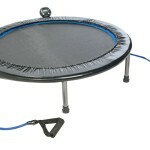 The round trampolines work with a controlled soft slow bounce and all the springs working at the same rate. It is simply in the nature with round trampolines to guide the user back to the center. This style gives an even bounce anywhere on the mat. This shape provides more jumping space and higher jumps, making it a preferred choice for gymnasts. An ideal model for anyone with multiple users. The mat is a spacious 15’ with 1” thick comfortable padding. The UV protected interlocking enclosure net eliminates gaps and protects the jumper from the springs. The netting design earmarks an exclusive feature by interconnecting the enclosure to the jump mat at each v ring. Reinforced, welded T sockets secure the upper enclosure to the frame preventing structural twisting. Galvanized steel frame material for enhanced durability and stabilization. Rust resistant springs and UV resistant materials for superior longevity. The bounce on the rectangular design is not controlled making it even from end to end. To the jumper, this means that any spot on the mat is going to provide the most extreme bounce possible. These are the tramps you will find in the sporting competitions and are extremely popular for families with participating members in gymnastics, cheerleading, and competition events. Since the jumper is not forced into the middle they are also great for doing tricks. 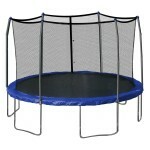 This particular model is number one in the top three trampolines of this shape category. Another reason for the popularity of this model is the leg design which consists of four legs that run diagonally across each corner. It is always a concern that jumpers practice safety measures when working or playing on their trampolines. Since this style and shape gives the ultimate in bounce and less control over the landing it is never a good idea to jump without the net in place. These mats are great for flips, jump routines and tricks. The best practice to consider when doing this type of work out is that only one person is on the mat at a time to ensure the safety of the jumper. Keeping in mind it is very easy to lose sight of where you are as a jumper doing tricks is very important. It is always a good idea for the buyer to be aware of all safety tips beforehand. Consider very clearly your purpose for purchasing before you make the final step. First and foremost look at the space you have available and make your selection accordingly for ample satisfaction with your purchase. 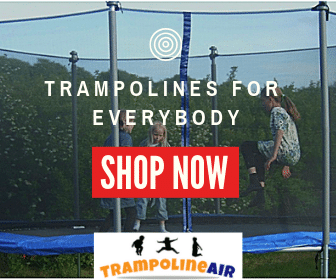 If you are purchasing a trampoline for just Childs play, then mostly any model and shape that has great safety features will do. If, however you have some more serious users involved who are considering use of the machine for gymnastics or weight loss, then this model may be an excellent choice for you. This particular design is structured with competition in mind. 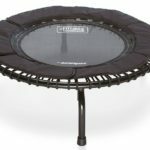 The Skywalker Rectangular Trampoline is very sturdy and well made in addition to being a beauty of a tramp with a very comfortable jump. It holds a top ranking in the rectangular model being the competitor’s choice. There is just really not a whole lot to not like about this model. Consumers here receive a high quality product that will not break after one year of use. The enclosure is not only extremely strong but attractive as well with its UV resistant polyethylene material. If you don’t mind a little assembly work when the boxes arrive then get ready, set and have some fun.